Tom Van Scoyoc relaxes into a butterfly pose during a class at Cary Flow Yoga. The seated posture opens the hips and stretches the inner thighs. Yoga and consistent stretching are said to improve back pain and help posture. Take one look at Instagram or the oh-so-addicting Groupon app, and it’s no question that yoga and yoga-inspired fitness classes have become extremely popular. Yoga uses breath control, meditation and physical postures to improve concentration and mindfulness. The ancient practice also helps improve strength, flexibility and balance. Yin yoga is a slow-paced style of modern yoga with postures that are held for longer periods of time. Flow, or vinyasa, yoga moves from one pose to the next smoothly and fluidly. Students can expect their heart rate to climb for a cardio workout during these energetic classes. 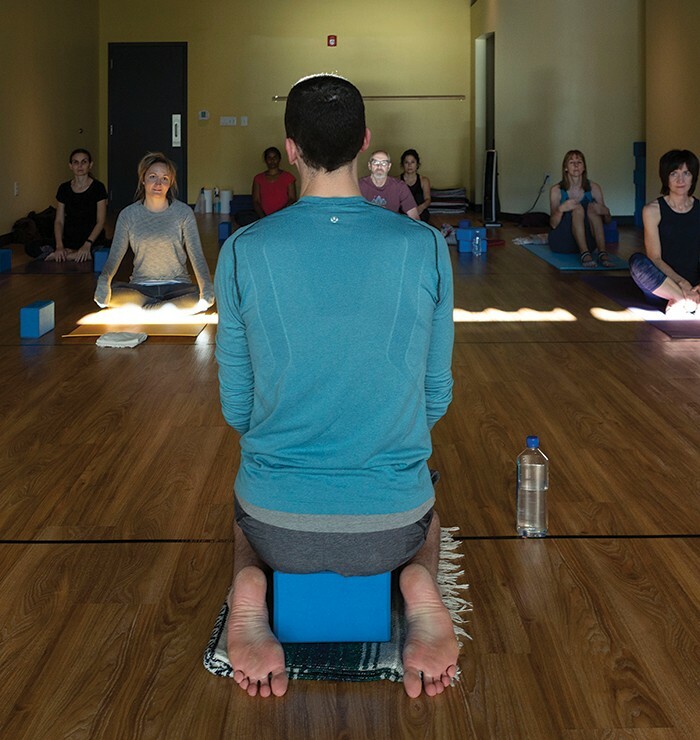 Restorative yoga classes use blocks, blankets and other props to support the body, so students can experience the benefits of the pose without effort. 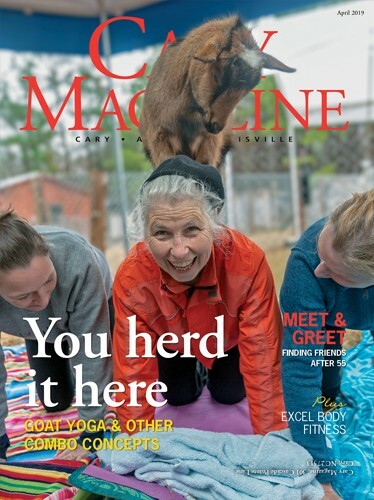 Whether you take a class at the neighborhood brewery or join a local studio, the Triangle has a wide variety of options to choose from — ranging from slow-paced stretch to yoga with goats. But if farm animals or folding like a pretzel aren’t exactly your things, have no fear — yoga is for everyone. The tall and the small, the strong and the weak, can all do yoga. Wise began yoga after experiencing issues in her corporate career and her personal life. Anxiety, depression and insomnia led her to a counselor who suggested taking yoga classes. Three months into her practice, Wise began taking teacher-training classes which led to where she is today — owning a yoga studio and meeting with clients daily to help them better their lives on and off the mat. Wise, who earned a master’s degree in health science with a specialty in yoga psychology, uses yoga and meditation to help her clients cope with depression, anxiety and other behavioral issues. 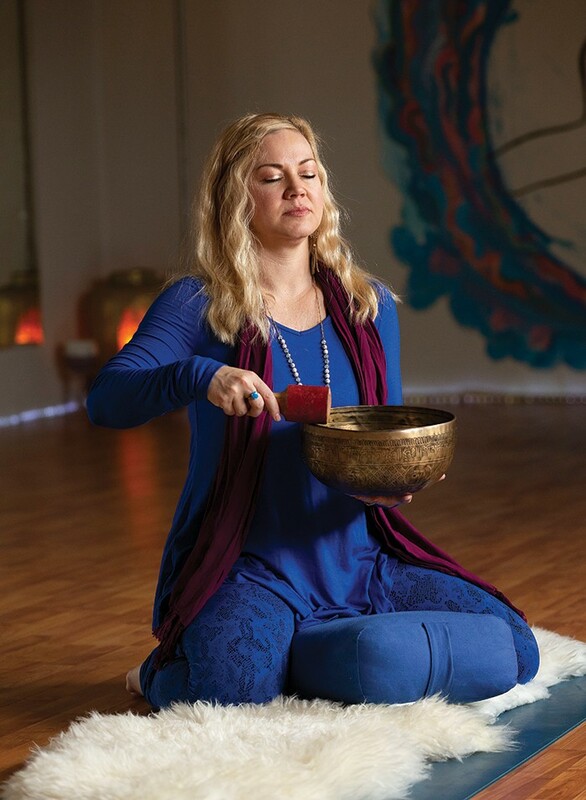 Jennie Wise plays a singing bowl as she leads a guided meditation practice at WiseMind Yoga. She uses yoga and meditation to help her clients cope with depression, anxiety and stress. Unlike fitness regimens with narrow goals — building muscle by lifting weights or increasing your heart rate by running — yoga allows students to build strength in the entire body. Every practice begins with breathing exercises to quiet the mind and increase concentration. This breath work helps students focus as they move through the physical postures, and it has also been shown to alleviate stress. “We are building life skills for ourselves when we are on the mat,” she said. Aside from the various breathing and meditation techniques taught in traditional yoga classes, WiseMind also offers a spiritual flow-to-yin or stretch class on Sundays. The class begins and ends with a prayer, and quotes and bible verses are spoken throughout the class as students move through poses. After a friend invited him to take a yoga class, Colin Russell decided he needed to make a change. Spending hours in the gym working out to solely bulk up wasn’t cutting it for his health. When the self-proclaimed “gym rat” took a yoga class, he fell in love with it. 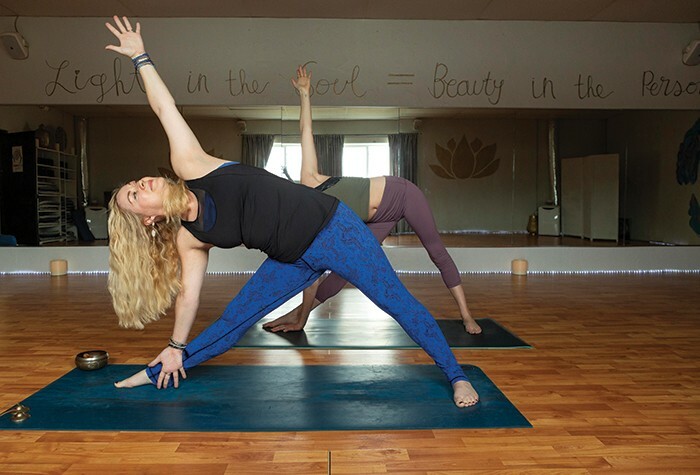 Jennie Wise and a student hold triangle pose, a deep stretch for the hamstrings. It also builds strength in the thighs, hips and core. 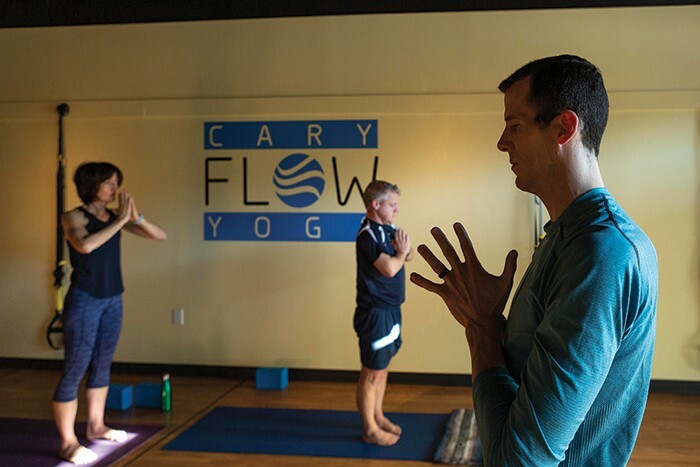 Russell is now the owner of Cary Flow Yoga, where he teaches daily classes. The studio offers multiple classes including flow, yin and restorative yoga. 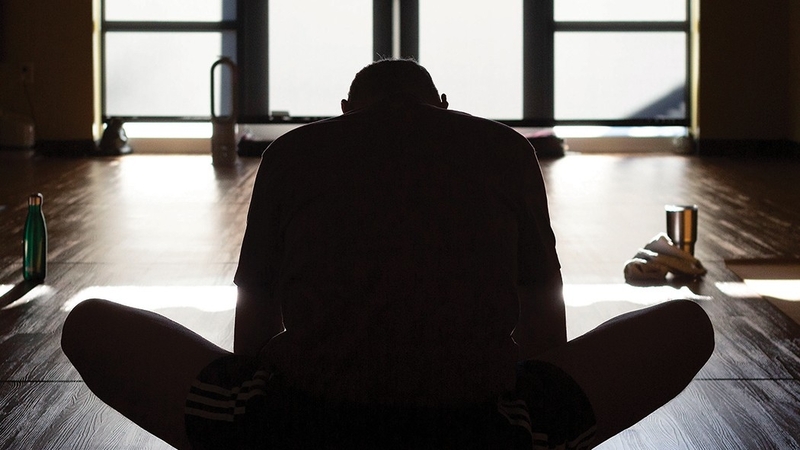 Hoa Bui, director of Cary Hot Yoga, broke the benefits of yoga down even further. Colin Russell, leads a class at Cary Flow Yoga. poses together to build stamina, flexibility and balance. Cary Hot Yoga specializes in Bikram yoga, which is practiced in a significantly heated room, sometimes up to 100 degrees. The heat and humidity help relieve joint pain and allow students to stretch without straining. Greg Meyers pauses in mountain pose to press his palms together and concentrate on his breath. The basic starting pose brings attention to posture and strengthens ankles, knees and feet. The studio also offers aerial yoga classes, where students wrap their legs, arms and torsos in cloth to stay airborne. The practice strengthens the upper and lower body and increases flexibility, all while suspending students in the air. At Cary Flow Yoga, athletes can increase their strength and balance with a variety of TRX bodyweight exercises, that benefit yogis and athletes alike. Like aerial yoga, TRX Suspension Training suspends legs or arms in the air using equipment that hangs from the ceiling with two straps on the ends for arms or legs. Colin Russell uses a block to modify a kneeling pose. By using props like blocks, straps and blankets, people of all abilities and fitness levels can reap the benefits of practicing yoga. In addition to the physical benefits of greater balance and strength, these yoga studio owners say yoga also transforms students by encouraging them to take time to breathe, to focus on the present and to be mindful throughout day-to-day activities.